Are you decorating in red? Add to your decorations an old fashioned inexpensive decoration. Crepe paper streamers are back. Fold to make your own garland or wrap around poles, railings or as apart of your hanging decorations for holidays and special events. 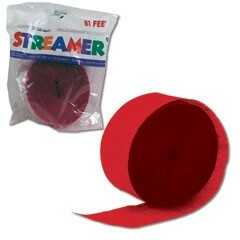 Our red crepe paper streamer roll is 81 feet in length and sold by the roll. Please order in increments of 1 roll.